Cristina is the creative mind behind The Castaway Kitchen. Put this quick, keto-friendly dish on your meal plan. 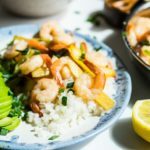 Shrimp sautéed in bacon fat and MCT oil makes for a perfect low carb, high-fat keto stir fry ready in less than 30 minutes. Pair this stir fry with a keto friendly vegetable side dish like cauliflower rice to pack a powerful nutritional punch. High in dietary fiber, vitamin C, vitamin K, potassium and beta-carotene, cauliflower is one of the best foods you can incorporate into a keto diet. MCTs (medium-chain triglycerides) are a type of saturated fatty acid. MCT oil is made with pure MCTs typically pulled from coconut or palm oil. Many traditional stir fry recipes call for sesame oil or olive oil. This dish uses MCT oil because it serves as a great source of energy and MCTs don’t rely on additional enzymes to be absorbed by your body. MCTs are also known to promote mental clarity, proper digestion and metabolic function. “Fat” is not a bad word on the keto diet. When following a ketogenic diet, you’ll want to use fattier cuts of meat because they contain less protein, but are high in fats. You should plan a low to medium level calorie diet with foods that are low carb, adequate in protein and high in fat. The healthy portion of bacon fat in this recipe makes it even more appropriate for a ketogenic diet. The bacon grease increases the fat content of the dish, keeping your fat stores high enough for your body to use as fuel. In ketosis, your body uses fat stores for energy. If your blood glucose level is too high due to excess carbohydrate intake, it will be difficult for your body to maintain ketosis. Fresh vs. Farm-Raised Shrimp: Does it Matter? While shrimp is a healthy protein choice, you want to opt for fresh, wild shrimp to get the best quality and reap the maximum health benefits. As emphasized in our Perfect Keto recipes, the source of your ingredients matter. Seafood is no exception. Many people don’t know the majority of shrimp found in United States grocery stores has been imported. Shrimp products are also often exempt from labeling when they’re added to seafood medleys, and restaurants aren’t obligated to label their seafood, either. This means we often don’t know whether the shrimp we buy is fresh or farm-raised. Farm-raised shrimp is produced in synthetic ponds under unhealthy conditions. The ponds are often so overcrowded with shrimp that they become polluted with waste. Shrimp farmers add chemicals to clean the waste, introducing the shrimp to potentially harmful contaminants. Avoid shrimp caught in fisheries that are not responsibly managed. Look for shrimp certified by a separate entity such as Wild American Shrimp or the Marine Stewardship Council to confirm the fishery is properly managed. Steer clear of purchasing shrimp overseas. Buy shrimp caught from wild populations in the United States. The U.S. has strict regulations regarding shrimp farming. Spread your cauliflower rice on a sheet pan, drizzle liberally with MCT oil and sprinkle with pink salt. Place in the oven when it comes to temperature, bake for 10 minutes. Peel and slice your ginger root and garlic cloves. Cut your green onion into 1 inch pieces. Peel a slice of lemon rind off. Heat a large skillet on medium heat. When it comes to temperature add in the bacon fat and all of your aromatics. Sauté until tender and fragrant. Add in the shrimp and sauté, stirring often until they are pink and coiled. Add in the coconut aminos and salt, stir another 2-3 minutes. Remove from heat. Serve your shrimp over a bed of baked cauliflower rice! Garnish with more green onion, sesame seeds or chili flakes! coconut aminos and the amount not in the ingredient list. How much to use? Hi Kathy, 2 tbsp of coconut aminos.